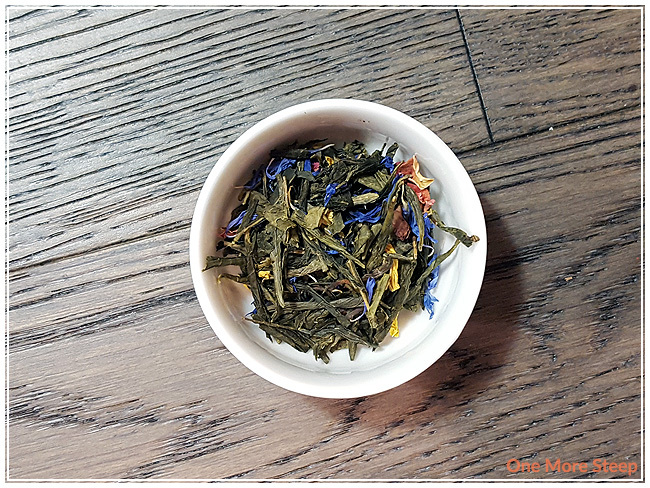 My first experience with Morning Dew was at the Vancouver Tea Festival back in November of this year, where I smelled a sample of the dry leaves and just fell in love. The best way to describe this scented green tea is it smells fresh – which makes me think that it’s an appropriately named green tea. 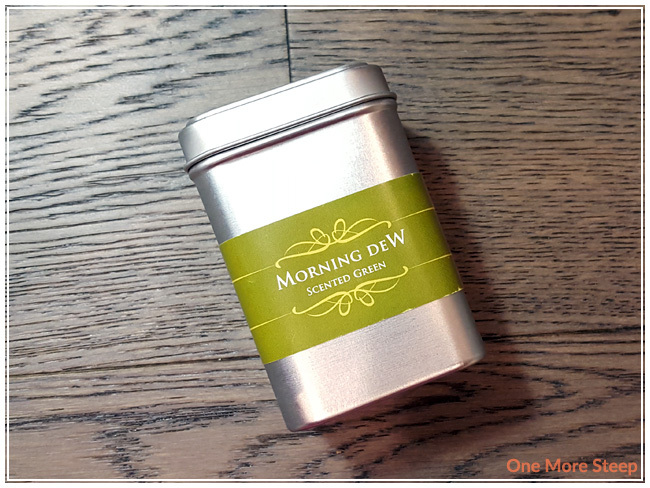 Morning Dew came to me in this cute metal tin – the tea was in a plastic bag inside, which I emptied out into the tin. There’s a brightness to the aroma that smells like roses and citrus. 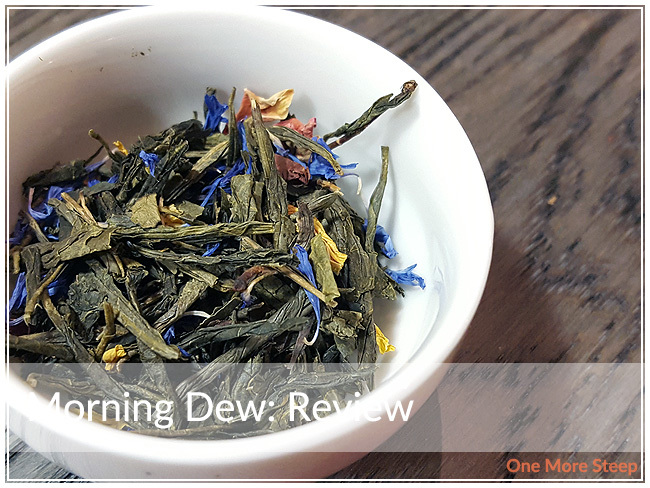 Morning Dew consists of “Japanese sencha, sunflower bits, cornflower bits, rose petals, and fruit essence”. Now I’m not too sure what “fruit essence” is, but I imagine that some part of it must be citrus based since the aroma of citrus (primarily oranges?) is very much present in this tea. There were no steeping instructions on the packaging, and I didn’t find any recommendations on the ShakTea website. I used the green tea setting on my Breville IQ Kettle (175°F/80°C) and steeped the tea for 3 minutes. My initial steep of 3 minutes was far too long! I found Morning Dew to be much too bitter and nearly undrinkable. So I restarted the process and steeped it for 90 seconds. I found that the green tea steeped to a nice yellow colour, while having a very bright aroma. I could smell the floral sweetness wafting up, along with the presence of citrus – so bright and refreshing smelling! 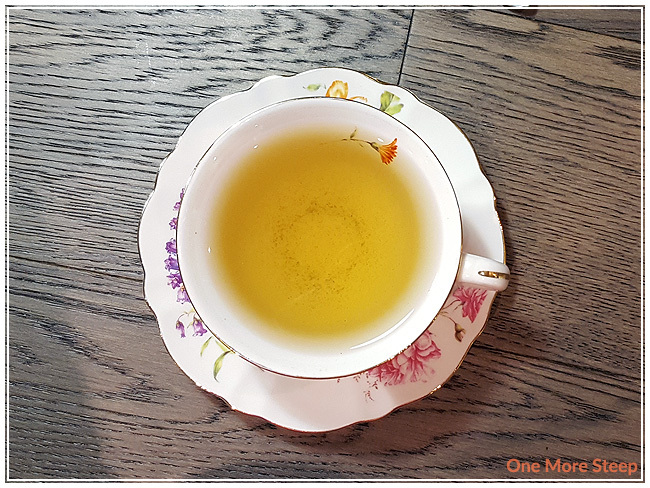 My first sip of Morning Dew (the second time around) was sweet, with an underlying flavour of saltiness, which I attribute to the sencha base. There’s a mild citrus flavour that isn’t as strong as the floral flavours – I believe that to be the case because it’s fruit ‘essence’ versus the flower ‘bits’. I resteeped Morning Dew for a quick 2 minutes, and found the flavours to be quite muted in comparison to the initial steep. 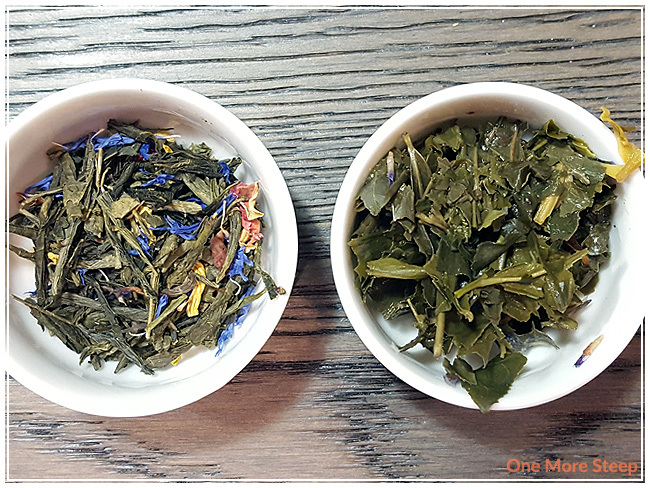 I found the citrus flavour to be quite dilute, but the floral and sencha base are still very much present. It’s a slightly less bright version of the initial steep. It’s still tasty, but not quite the same.